Nettles embody the vitality of spring – their small leaves pack a powerful sting and are filled with a whole range of vitamins and minerals, as well as being high in fibre and proteins. They are traditionally used as a spring tonic, providing a nutritional boost after a winter diet of dried meat and grains. Fortunately, stinging nettles are easy to come by and very versatile in the kitchen – if you ever run out of ideas for how to use them simply find a recipe that uses spinach and replace with nettles. 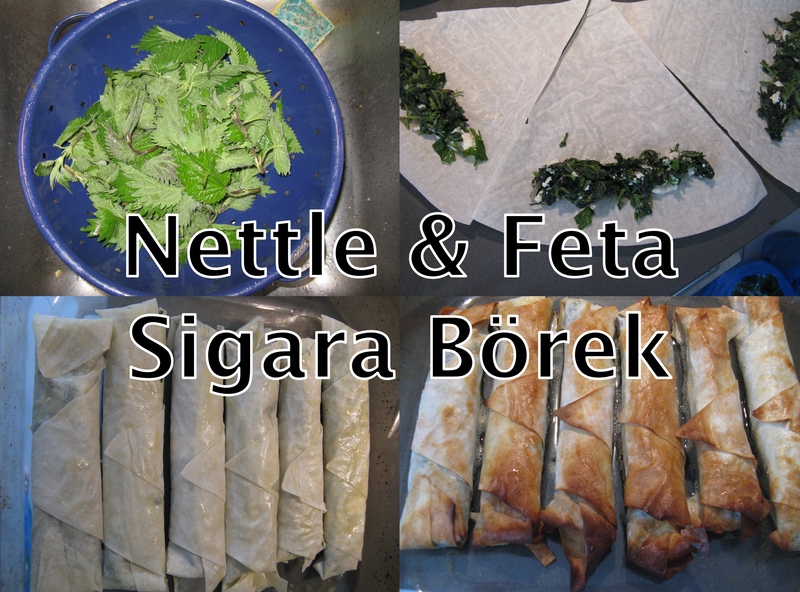 A recipe I keep returning to is for the Turkish sigara börek; spinach mixed with feta and baked in pastry rolls (hence the name ‘cigar’). These little parcels are quick and easy to make and work just as well with nettles. Throughout the year this recipe can be adapted for all sorts of wild greens; some of my favourites include sow thistle, sea beet, fat hen and cleavers. They make a great portable snack, and are always popular when I bring them along to my foraging courses. I used ready made sigara börek pastry from my local Turkish shop, but you can make your own pastry or use any type and shape of filo pastry. They can be frozen if you feel like making a large batch, and can also be fried rather than baked. I normally keep the water from blanching to drink as tea as it absorbs some of the nutrients from the greens, especially the vitamin C.